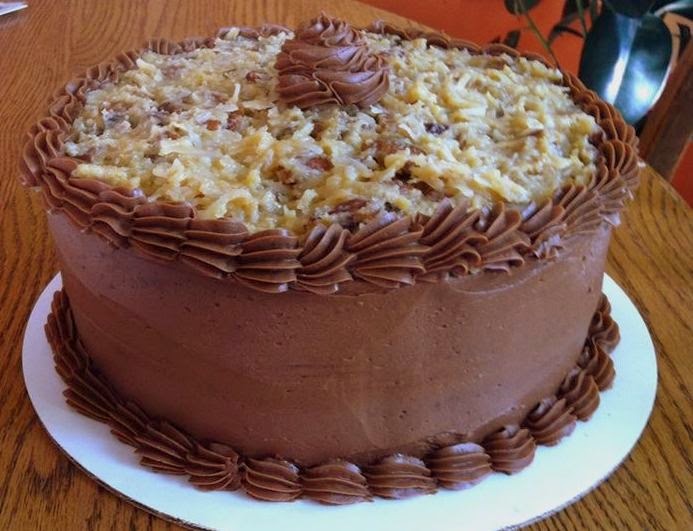 Either you love or hate German Chocolate Cake. For me, it is love. Coconut, pecans, chocolate frosting...nom nom nom! I happen to love the extra caramely/coconutty/pecan frosting a wee bit too much...to the point that I eat the leftovers with a spoon. I. Am. So. Ashamed... (not really). I mean, look at that photo. There is so much delicious glory going on in it, don't you agree? The German chocolate cake itself. Did I mention the chocolate buttercream and the coconut/pecan frosting? 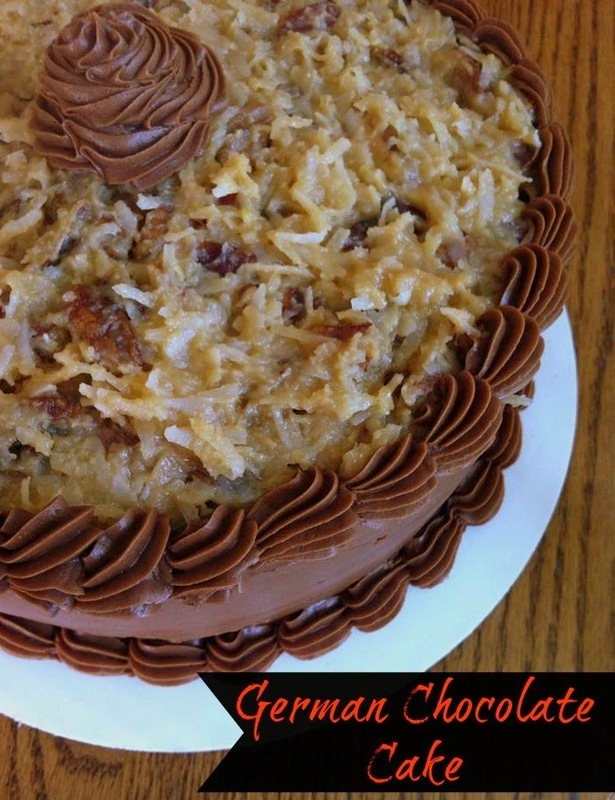 I have tried several German chocolate cake recipes and this one is my favorite. It hasn't let me down the numerous time I have made it. Most times people make a chocolate ganache to spread or drizzle over the cake, which you could do. But, I love buttercream frosting, so I always whip up a batch of chocolate frosting to encase the cake in with. I don't put in between the layers, which you could do. I just put it on the top and sides, spread the coconut frosting over the top (and in between the layers) and then pipe a border around to hold it all in. The cake is easy to make and it comes together simply. I like to cook the coconut/pecan frosting before making the cake, so by the time the cake is baked and cooled, the frosting is also cooled enough to use without having to wait around for it much longer. In a saucepan, whisk the sugar and evaporated milk together. Add the yolks one at a time, whisking well after each addition. Add the butter to the mixture and whisk while cooking over a medium heat until it boils. Reduce the heat and let frosting thicken, whisking as needed. After the frosting coats the back of a wooden spoon, remove from the heat and add the coconut and pecans. Mix well, adding more coconut if wanted to make the frosting as thick as you'd like. Set aside to let cool to room temperature. Prepare 2 or 3 - 8" cake pans with shortening and flour. Add the chocolate pieces to the boiling water and stir until the chocolate is completely melted; set aside. In a mixing bowl beat the butter and sugar together until light and fluffy. Stir in the separated egg yolks (I crack my eggs over a glass mixing bowl, leaving the whites in the bowl and beat with a hand mixer later) one at a time. Add in the vanilla extract and the chocolate slowly. Continue to beat until well combined. Sift together the flour, baking soda, and salt into a separate bowl. Add the sifted flour alternatively to the creamed butter mixture with the buttermilk until all is added and the batter is thoroughly combined. Using a hand mixer, beat the egg whites until they can hold stiff peaks. Fold the beaten egg whites into the chocolate batter carefully. Pour the batter evenly into the prepared cake pans. Bake for 30-40 minutes, depending on how many cake pans you use. Remove from oven with a toothpick inserted in the center comes out clean and invert the cakes to cool on a wire rack. Cream together the butter and sifted cocoa powder. Add the powdered sugar 1 cup at at time, alternating with a tablespoon of milk in between each addition. Keep adding sugar and milk until you reach your desired consistency. I like mine a little stiff, so I add more sugar - less milk. When everything is cooled, I even out the cakes by slicing across the top of each one with a bread knife (a long, serrated knife will do). Then, I make a shallow crater in the top of each cake for the frosting to sit in without oozing out of the sides of the cake. Make the crater a bit deeper near the center, and barely cut in at the sides. This creates a little "bowl" for it to sit in and nobody even notices it when you are eating the cake. Add some of the coconut/pecan frosting to the top of the bottom cake layer and even out to the edges until it is smooth. Place the next cake layer on top, repeating again if you made three cake layers. Using a spatula, frost the top and sides of the cake with the chocolate buttercream frosting. Add a thick layer of the coconut/pecan frosting to the top of the cake, coming out almost to the edge. Pipe around the edges of the cake with the buttercream.